The Black-chinned Hummingbird, also known as Archilochus alexandri, has a far reaching presence. You’ll find them along the Gulf Coast (usually during the winter) and throughout the western part of the US. They can live in dense mountain forests as well in the desert. 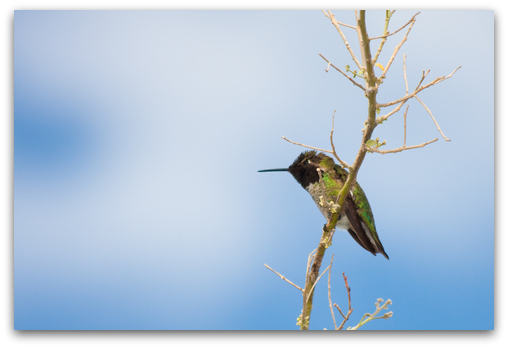 Unlike some hummers, this flying jewel doesn’t have a large area of brilliant color on its throat. Instead it has a thinner strip of purple on its chin. When the light hits the chin just right, you’ll see a wonderful flash of color. Male Colors: Back is metallic green while underside is gray-to-white shading. Throat is a black with the iridescent purple chin. Female Colors: Throat is pale. Size: Small, about 3.5 inches. Females are normally larger than males. Tail: Outer tips of the female’s outer feathers are white. Insects provide fats & protein, while nectar from flowers (as well as sugar water in human placed feeders) provides the energy they need for their constant activity. It'll often perch high to view possible food sources. They like bare branches at the top of trees. Once a Black-chinned Hummingbird swoops down to feed, you’ll see it darting in an almost erratic manner as it feeds on insects and from feeders or flowers. They can capture insects in mid-flight. Sometimes they’ll grab as many insects as they can in one big swarm. Other times, they’ll grab one and fly back to their perch. Unlike other hummingbirds this one is more attracted to colors from their most recent sources of nectar… as opposed to only the normal red color. During the winter, the Black-chin is found along the Gulf Coast and in northern Mexico. During the summer, they breed from northern Mexico, central Texas, throughout the western states and on into British Columbia. Mountain forests and desert lowlands are their normal habitat. They live along rivers and in canyons along the southwest region. When it’s a more dry area, they’ll live near sugarberry, oak, willow, cottonwood, and sycamore. The Black-chinned hummer is one of the most adaptable of all flying jewels. You’ll see them in cities if there are quality sources of vines, flowers, shrubs & tall trees. During its mating ritual the male Black-chinned will use a stunning display of flying acrobatics. It will dive from as high as 100 feet in order to impress and attract females for mating. Once mating is done, the female builds her nest. Mom usually places the nest about 6 to 12 feet above the ground. She'll normally place it on a horizontal dead branch. Because the nest is built from insect and spider silk it can expand for its growing nestlings. At the beginning, the nest is like a deep cup. As it expands it transforms into a more shallow, wider cup. You can sometimes find their nests every hundred yards along rivers in the southern parts of New Mexico & Arizona. Normally their hearts beat at about 480 beats/minute during rest. They use a torpor state on cold nights to bring the rate down to 50-180 beats/minute. As they migrate they’ll stay at a feeding source for only a day before moving on. Eggs are as big as a coffee bean. Its tongue will use 13-17 licks/second through the bill as it feeds. The tongue has 2 grooves. Nectar flows through these grooves. Once the tongue is retracted the nectar is squeezed into the mouth.